If you’ve ever seen the Terminator series of movies featuring bodybuilding legend Arnold Schwarzenegge, you have learned one lesson, and learned it well. We cannot trust the machines! They have been sent back in time to destroy civilization, blow things up, and otherwise ruin peoples’ days. In bodybuilding, machines get a bad rap as well. Any time you look over at the machines in your gym, it’s very likely you see some devices being used by less-than-serious lifters, with less-than useful weight. Machines are easier and safer than free weights. The safety issue can be important to those with less training experience or muscle mass, who therefore cannot control the weight like a larger, more experienced bodybuilder. However, the fact that many bodybuilders move to the machines to take it easy, seems to give them a bad reputation. The secret to success with using machines for making muscle gains – particularly in the upper arms – is to use them to make the exercise harder, not easier. The machine controls your range of motion and forces you to flex at the same point on every repetition, without resorting to cheating or a swinging of the weight. What we seem to forget is that Casey Viator, Mike Mentzer, and yes, even the great Arnold Schwarzenegger himself, used machines very frequently as they lifted. Of course they realized the usefulness of free weight squats, deadlifts, rows, and bench and shoulder pressing for building muscle mass. But they were also aware of the fact that with training so much, there was no way in the world that their joints and muscles could recover fast enough from compound lifting. Plus, they knew that it was essential to hit the muscle groups (particularly smaller groups such as biceps and triceps) with deliberate, slow targeted work. Machines provided that. Thirty years later, bodybuilders are divided. With the use of many of today’s advanced drugs and judging panels which award mass monsters, many guys do focus primarily upon the heavy compound mass movements in order to gain a lot of muscle and keep it on. As a result, we don’t see the clean, lean, crisp defined physiques of years past. Instead, the stages are literally littered with bulky clones. As a bodybuilder rising through the ranks with complete control over your training regimen, you can change this. You can become one of the Bob Cicherillo clones that trains light with machines, and still win bodybuilding titles. You don’t become the biggest man on stage using machines, but you do possess one of the best physiques up there. 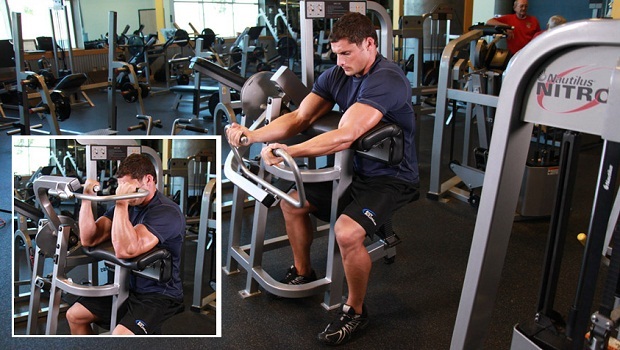 Useful biceps machine movements include cable curls with one or both hands, preacher machine curls, and the wide variety of dedicated machines. Useful triceps machine movements include cable pressdowns, overhead cable pressdowns, and the wide variety of Hammer Strength and Nautilus machines your gym offers. There are literally dozens of variants, but they all pretty much focus upon the three heads of the triceps with good accuracy. Keep your repetitions slow and under control, and focus upon flexing the muscle group at the peak contraction point of every repetition. Over time, you’ll see shape and lines emerge from the machines that will certainly give you an advantage on the bodybuilding stage. I’m still not saying you should trust any machines that travel back through time hell-bent on destroying the planet, but those in your gym are probably pretty safe – and actually useful as well! This entry was posted in Bodybuilding, Training and tagged Biceps, Biceps Training, Triceps, Triceps Training, Triceps Workout. Bookmark the permalink.